Frozen! I wake up and my tent is frozen. Cold, cold, cold, the air funneling down this valley from Mount Whitney is icy. It's dark but time to get up. The sun won't be up here for a while since east is on the other side of a huge mountain. I get up again in the cold. Ice crystals fall on my head if I bump the tent. I try not to do that. My sleeping bag is damp again. I'm leaving it out and my tent setup as I hike up to the top of Mount Whitney. I eat breakfast outside, in the dark. My hands and feet are so cold they hurt. I hold my cup of Starbucks caffe mocha with both hands hoping they'll warm up to the point that they don't hurt. We set out at a fast pace hoping the pace will warms us up. I am not using my trekking poles because they're holding up my tent. I can't keep the pace up and slow down to something I can sustain. I am wearing my pack but with significantly less stuff. Some water, fleece, lunch, sunscreen, sunglasses, shade hat, phone, and micro spikes. It feels as light as a feather. I hope to be able to post some blog entries. I have not had any coverage for days now. I climb up a long trail. Up, up, up, it's not necessarily steep just all up. It's not long before I encounter snow. Snow on the trail means ice on the trail. Braveheart is somewhere way up ahead. I am plugging away by myself. Higher and higher. The lakes I was walking past look like tiny puddles below me. The sky is clear and blue. I put on my microspikes. Microspikes are things I can attach to my shoes that have little spikes in the bottom so I have better traction on ice and snow. Wow! They work great, I able able to climb faster and safer without having to worry that my feet are going to slip. The higher I go, the more snow there is. Then there's the wind. The wind has an icy chill. My wind breaker does an amazing job keeping my core and my head warm. I keep my hands in my pockets because I have no gloves or mittens. Then I remember that I had the sleeves of my windbreaker cut extra long for this exact reason. I tuck my hands into my sleeves and they stay warm too. The air is crisp and clear like it gets on those cold clear winter mornings. That's exactly what it feels like. I started singing Olaf’s Summer Song over and over in my head trying to remember the words. 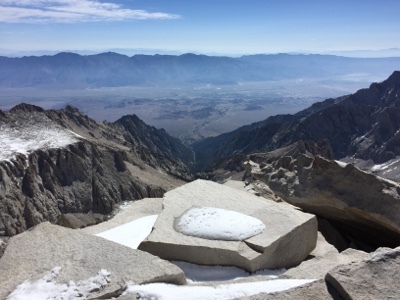 The top of Mount Whitney is bone chilling cold. I stand on the tippy top and push the button on my Spot to mark it on my map. I take my phone out of airplane mode, No Service, that certainly was a long hike to find that out. Then I snap a few pictures and head into the warming hut. It's not long till the warming hut is full and more people keep crowding in. Here we are surrounded by amazing scenery and we are all stuffed in this tiny one hundred and four year old rock building. I eat a couple snacks then ask Braveheart if she's ready to head down. She hates the cold, she nods. I put on my fleece for the walk down reasoning that since I won't be working as hard I won't be generating as much heat. I'm glad I did. It's colder going down. I am pretty well wrapped up except my face. Down, down, down, all the same trail as when I came up. I am in front this time and moving well. There are lots of people coming up now. It's still cold at the top but the trail conditions are getting slushy and sloppy. Water everywhere. The trail in places is a stream. I keep moving and the lower I go the warmer it gets. I reach the point I no longer need my fleece, I trade out my beanie for a shade hat. Lower and lower, down to where normal things are. I stop and wash my socks spare socks and hang them outside my pack to dry. We arrive back at camp and begin to pack up. We want to get closer to Forester pass so the we can cross it in the morning when it's still solid. We hike with our goal being Tyndall Creek, about eight miles. We have to ford Wallace Creek first. There is a pack of about eight of us thru-hikers all bunching up at the crossing. I think, I'll just take off my shoes, socks, gaiters, and zip off pants legs and wade across. I start to do that and realize that the middle is deeper than I thought. I head back and put on my shoes. Once across I wring out my shoes as best I can and put everything back on. Then I reach Wrights Creek. Do it all over again. This time however, my attention to detail has put me in the back. I don't want to be back here. Everyone is marching on to Canada and I am left in the forests of the High Sierra. I pick up my pace and eventually catch up to Braveheart. She is sitting at the side of a stream about a mile before Tyndall Creek. It appears that everyone else is choosing to camp here. We however, are not. We head down to Tyndall. It's the biggest creek yet. Lots and lots of icy cold snowmelt water. I know you should ford streams in the morning when the flow is lower. Braveheart has a problem with cold, she hates it. Would rather cross in the warm afternoon. The problem is ii is past afternoon and closer to dusk. She wades thru without a problem. Instead of taking the time to remove all my things again I choose to simply wade through with everything on. Shoes, socks, gaiters, pant legs, all soaked in icy cold water. We hurriedly hike up the hill and find a camp that might not be as condensation prone and setup. My feet are soaking. We go and collect water. My feet are soaking and freezing. By the time dinner and chores are done all I can think about is how bad my feet hurt. I climb into my tent, carefully remove my wet stuff and hold my frozen toes in my hands until they begin to warm. I lay in my bag in my warm tent. It's been a long day. I am camped where I can hear moving water. I am warm. All is right with the world as I drift off to sleep.